Speakeasy #143 — The Red Flower | Oh Danny Boy! “There was a loud crash in the hallway.” Heikapu thought this was very uncommon in the house that she and Tapuarii shared. It actually was not their house but they lived there when the owners were on business either in Europe or in the U.S. The owners were very rich and seldom stayed there. Instead they would make it available to some of their fancy friends, actually fancy rich friends, or if none of their friends were available Heikapu and Tapuarii lived in it. But very carefully. The owner’s checked everything when they returned. 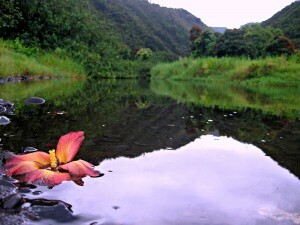 Heikapu and Tapuarii carefully picked up their dirty sheets, towels, their clothing and carted them back to their hut. Then the rest of the house was made spotless. The owner’s were scheduled to return tomorrow. This is why the loud noise coming from the hallway frighten her. Tapuarii was out on the ocean fishing for their evening meal. She tied her long hair up and tucked the red Hibiscus behind her ear. She wondered if Tapuarii knew what the Hibiscus indicated. She thought not. She was brought out of her dream by another loud sound from the hallway. This one much closer than the last. Then the sound of chairs being pushed against the door made her realize that there was someone in the hall and they were barricading her in Tapuarii’s den. A room with no other exit. But why? And then she smelled the unmistakable. Smoke! Good God, what did these people want from her? From behind the door a voice demanded “when will he be back”? Now she could see the smoke as it drifter into the room. Panic began to sink in. The kind of panic that is a precursor to death. 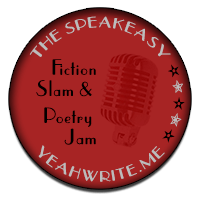 This entry was posted in Speakeasy and tagged Fiction, Flash Fiction, Short Stories, The Speakeasy by Danny James. Bookmark the permalink. Thank you, but I take a respective second to your writer’s block. Good luck tomorrow. Sad! Great story! I want to know what the hibiscus means now. The hibiscus indicated that she was an available women. Her love died with her death. That is a sad one. I guess Tapuarii is alive, No ? Anyhow I really hope Heikapu escapes from the bad people. Lovely story ! Thank you Lala and taking the time to read and comment. Perhaps you will find the answers in a follow up post. How terribly sad. They were obviously being watched, which is creepy in itself. Now, I’d like to know what business the murderer has to take up with the home’s owner! It’s a scary story. I hope Heikapu will escape. We will see! Thanks for taking the time to comment. Oh so sad! I was hoping she would escape. Does the Hibiscus mean she’s pregnant? I hope somebody catches the guys who burned her alive. Well, that was a cheery piece. I have to go look up the Hibiscus flower now. That’s what got me started. Thanks for the comment Ted.